wedgwood jasper | Skinner Inc.
Wedgwood jasperware has been in production for well over two hundred years. In the manufacturing of jasper there are two primary categories: solid jaspers were turned or molded from a solid piece of colored clay; and jasper dips were made by dipping the typically white solid jasper body in colored clay to give the surface an entirely different appearance. 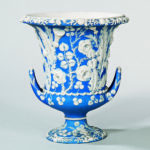 In both varieties, Wedgwood’s typical classical subjects and foliate designs were applied in relief, often in a complimenting color or colors. With two, three, four and five color examples, the possible combinations of colors are nearly endless.